We have finalized the 2012 SC27 National's yacht club sponsor, location, and dates. The input from the 2011 SC27 National Class Association Meeting drove De Schuyler and Bart Goodell on a quest to secure our sponsor, location, and dates for the 2012 SC27 Nationals. 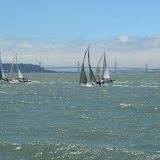 Thanks to hours of research and making contacts in the San Francisco Bay area, they were able to secure Richmond Yacht Club as our host and we have the calendar dates of Friday, June 29th, Saturday, June 30th, through Sunday, July 1, 2012. The Richmond Yacht Club has a history of hosting some great racing venues and gracious hospitality. We look forward to working with Pat Zajac, our contact at the Richmond Yacht Club. The National Class Annual Dues ($27.00) run from January through December according to our Constitution. These class dues support expenses (mostly National Regatta costs) and provide paid members the right to a vote on any Constitutional changes, amendments, elections, etc. Please forward your 2012 SC27 National Class dues to Barry Whittall, 668 Colleen Court, San Jose, Ca. 95123-5509.